Nematode, or roundworm, neurons are more diverse than previously thought. Although nematodes have been model organisms for studying neuron function, this study shows they can become models for studying neuron evolution. 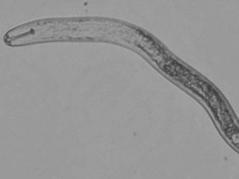 Knowing that some parasitic nematodes have unique neurons may lead to development of new pesticides that could better target problem species. URBANA, Ill. – Nematodes, an abundant group of roundworms that exist in nearly every habitat, have long been used as model organisms for studying the function of neurons – the basic unit of animal nervous systems. For years, it was assumed that neuron anatomy was remarkably similar across this large and diverse group. A recent study by University of Illinois researchers turns that assumption on its head. The paper, "Unexpected variation in neuroanatomy among diverse nematode species," was published in Frontiers in Neuroanatomy. It was co-authored by Ziduan Han and Stephanie Boas, both from the U of I. Funding was provided by the National Institutes of Health and the Hatch Program. The article can be found online at http://journal.frontiersin.org/article/10.3389/fnana.2015.00162/abstract.